A halogen lamp is an incandescent lamp with a quartz glass envelope which is more resistant to high temperatures, and with an internal pressurised halogen gas atmosphere. This gas strongly limits the sublimation of the tungsten filament and favours the deposit of the sublimated tungsten onto the cooled filament and not on the quartz glass sides. 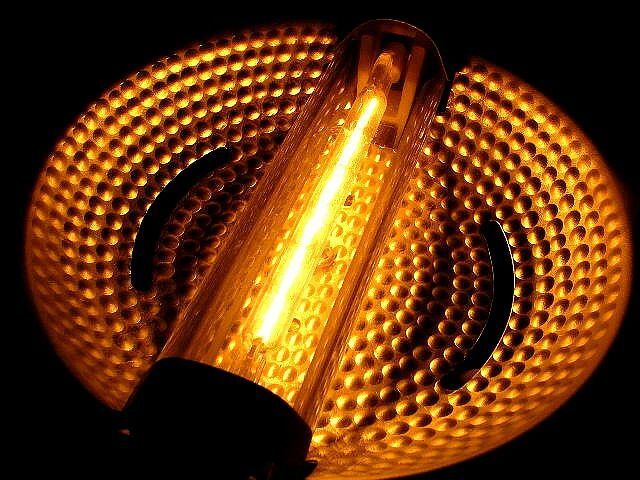 The filament of a halogen lamp can therefore be subjected to higher temperatures than filaments used in classic incandescent bulbs. This produces more intense light while consuming the same amount of electricity. However, although the light output of halogen lamps is higher than the light output of conventional filament bulbs, the intensity of this type of lamp creates indirect lighting, which reduces efficiency de facto. In addition, if impurities come into contact with the amorphous quartz glass (for example, if someone's fingers touch the glass), the glass's crystallisation temperature lowers to a level approaching the operating temperature. The transformation of the glass thus makes the lamp more fragile and therefore reduces its service life.